It feels like a lifetime since I've seen Clive Owen in a movie. I thought he retired from acting. No matter. 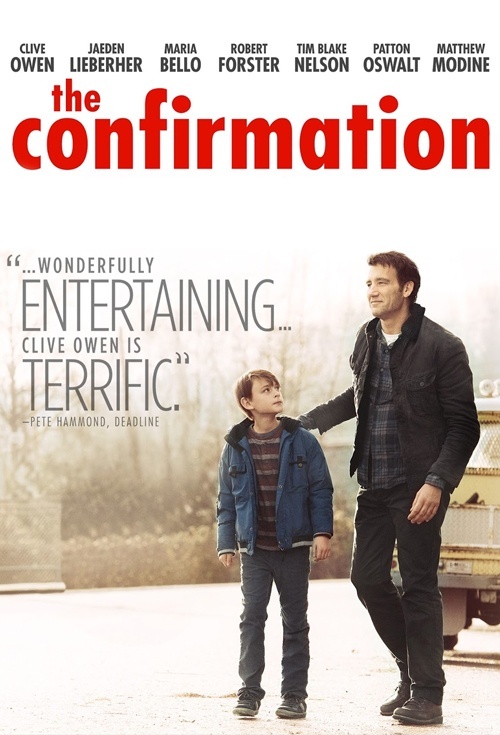 He shines like nobody's business in 2016's The Confirmation, a sort of cinematic slice of grated Americana (even though it was filmed in Canada). While watching this thing, you kinda wish it was all shot in black and white. Either way, I was easily enthralled. Owen plays Walt, an alcoholic trying to abstain from his intrusive habit. He goes through withdrawal, avoids temptation when he sees nothing but wussy wine coolers in his ex-wife's refrigerator, and turns his head when he drives up to various taverns. He knows that if he gets intoxicated, he'll never get to hang out with his son Anthony again (played wonderfully by Midnight Special's Jaeden Lieberher). Speaking of his son, well Anthony's first Confirmation and/or Communion is coming up. This vehicle chronicles him and daddy-o spending a weekend together leading up to those events. Clive Owen stripping himself down, shucks a cocky air and dives deep into character. His Walt in a sense, is a good person on the inside but at the same time, a down on his luck kind of guy. He's getting evicted from his house, his car won't start, and the tools he uses for his odd jobs in carpentry, have all been stolen. At a running time of 90 minutes, Walter and Anthony try to track down the thief of said tools and bond quietly in the process. Bottom line: The Confirmation despite being a little too dogged and small scale, is still a winner much of the way. With facile chemistry between the leads, it's more entertaining and less arty than most independent flicks. Containing a hoot of a supportive performance from Patton Oswalt, an almost unrecognizable Matthew Modine, and a setting complacent to the state of Washington (at least that's what the license plates revealed), "Confirmation" reminded me of 2000's Wonder Boys, last year's Grandma, and an Alexander Payne film (it seems logical being that director Bob Nelson wrote Payne's Oscar-nominated Nebraska). What's on screen is character-driven and whimsical with a certain aroma of sadness. In essence, it's like a road trip movie confined to a medium-sized town in which various, peculiar people fade in and out. And since The Confirmation is billed as a comedy, the humor is there but it's invariably dry and off-kilter. You have to pay really close attention in order to catch any truthful zingers (if you do laugh, it distracts you from what is otherwise a depressing yet rewarding experience). Rookie director Bob Nelson keeps the atmospherics damp and overcast but lets his camera mainly capture the forgotten love between father and son. He also wants you the viewer, to fixate on whether or not Walt can get his act together and get his misunderstood life back on track. Nelson edits in chunks as "Confirmation" goes back and forth between coming-of-age eradication (Anthony can't decide what to say at Confession, can't decide if he should go to church, and thinks he's not being true to his Catholic faith) and chronic alcoholism tutorials (when Walt can't get his hands on a stiff drink, he talks to himself and has weird stomach pains). 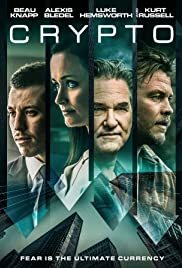 Lastly, despite some rough edges to go along with a questionable PG-13 rating, The Confirmation still has a twangy, feel good soundtrack, decent camerawork echoing all things Payne, and a sense of being stately offbeat (that's a good thing, trust me). Rating: A "confirmed" 3 stars.